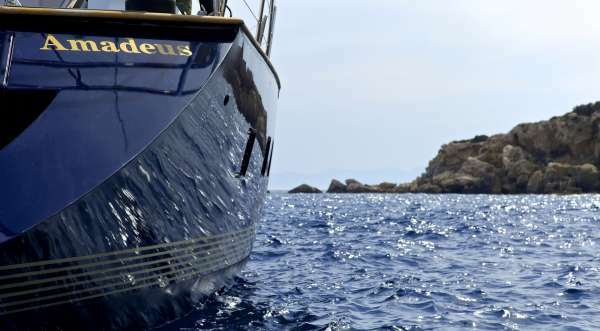 Built by the famous Dynamique Yachts shipyard, and having undergone a total refit in 2018, S/Y Amadeus was designed to please the most demanding of yachtsmen. 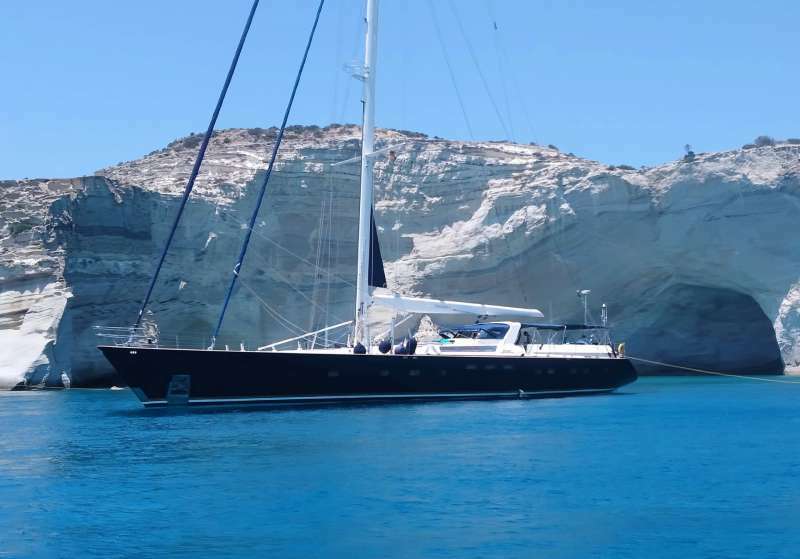 Built for smooth sailing, this elegant cutter rigged sloop has a sleek hull design, comfortably reaching top speeds of 12 knots and ensuring excellent sailing performance.S/Y Amadeus has just undergone this past winter (2018) a major refit such as total repaint top to bottom, new rigging (BSI Denmark), new exterior fabrics and many more. 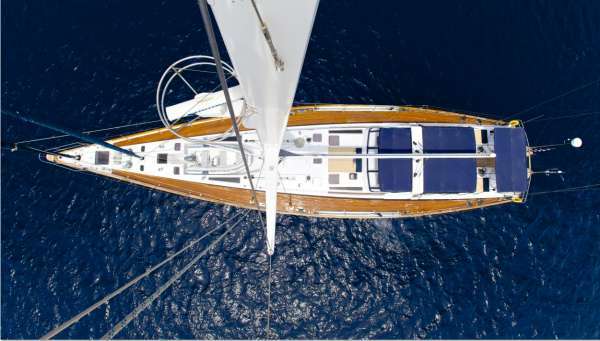 In 2016 new “North Sails” were placed onboard. 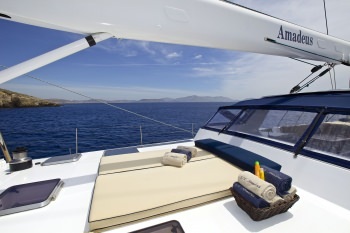 The yacht is maintained in excellent condition with a five-star crew year round.Her generous uncluttered teak deck offers plenty of space for sunbathing. 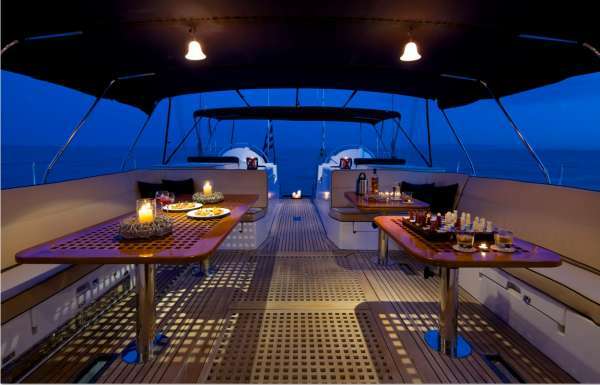 The spacious and unique outdoor saloon has two tables sitting 12 guests and is a perfect setting for outdoor dining and entertainment. 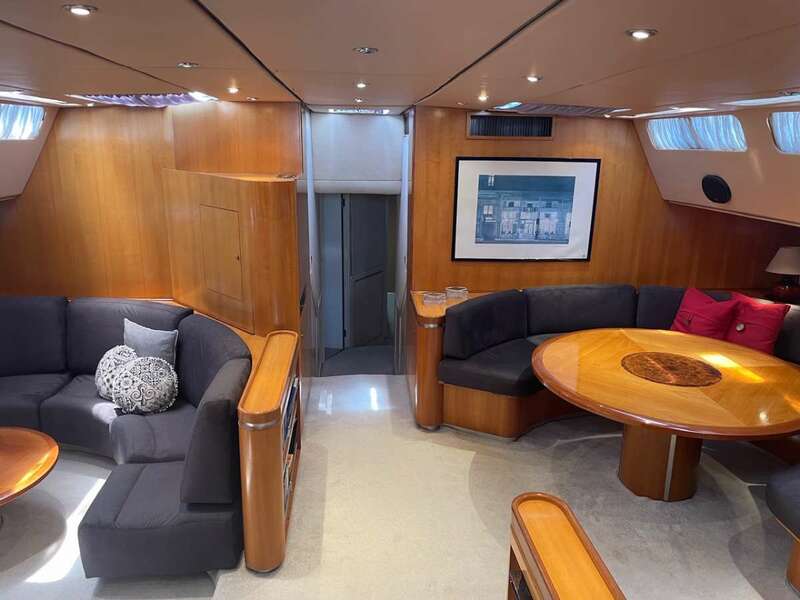 Thanks to a special canopy and roll-up windows, the deck saloon has the added attraction that it can be fully enclosed, making it ideal for all weather conditions. The front sunbathing area can also be shaded with a removable awning.From the cockpit, a stairway leads to the light-filled spacious saloon offering ample seating, ideal for relaxing or enjoying a drink from the bar, and offers a formal dining area. Captain Nicos is a graduate of the Merchant Marine Academy and holds a Captain Class A’ Diploma. 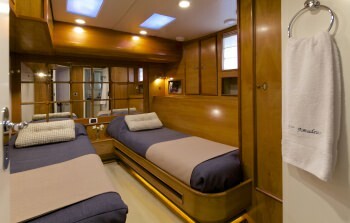 He has over 17 years of service at sea onboard many Charter Yachts and Cruise Ships. 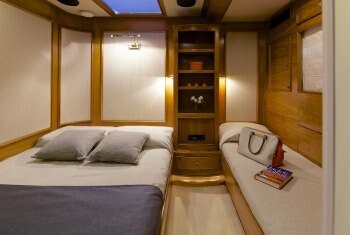 He has been on board S/Y Amadeus for the past 8 years and will also cruise at night, weather permitting. He holds Certificates in GMDSS, Fir Fighting & First Aid, Personal Safety, Life Saving, and Ship Security. 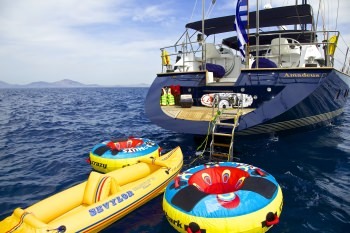 Captain Nicos is an avid Sailor and an excellent host. He speaks English. He is 51 years old, married and has three children. Nikos holds an Engineer Class B’ Diploma from the Greek Merchant Marine Academy. 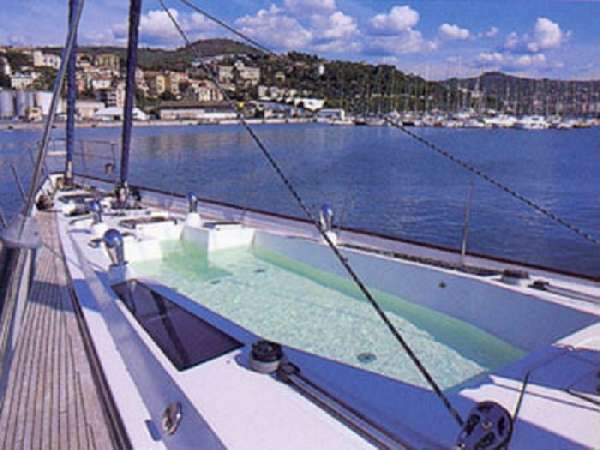 He has over 18 years of experience onboard Ocean Going Vessels and Charter Yachts. This is his second year on board the yacht. He speaks English and is 42 years old. Thanasis is a certified Master Chef, Post Graduate in Culinary and Pastry Studies at Switselhoff in Bern, Switzerland. 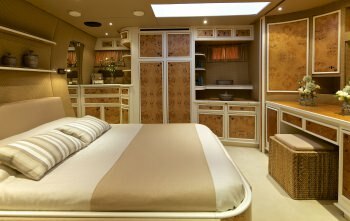 Throughout his culinary carrier he has served on board many prestigious privately owned mega yachts. 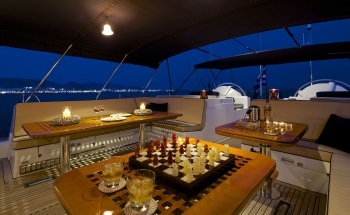 On shore he has worked as a chef at the Athens Hilton and as a head chef at the Meridien - Plaza Hotel in Athens. Thanasis also had the opportunity to work as an in-house chef for some of Greece’s most elite families. His culinary talents include Classic Greek, Modern Greek, French, International and Pastry. Thanasis is Greek and speaks good English and French. 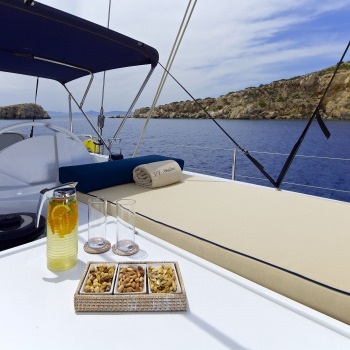 Mirella has 6 years of experience as a stewardess onboard charter and private yachts. 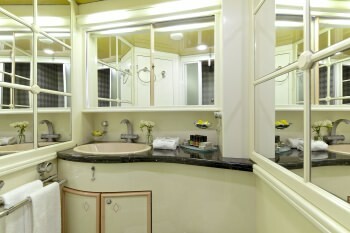 She has a very pleasant personality and she aims to accommodate her guests to the fullest. Comments received from previous guests are memorable. This will be Mirella’s fourth season onboard. Mirella speaks English and she is 35 years old. 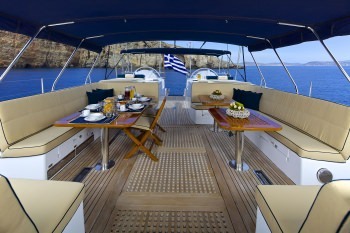 Going Vessels and Charter Yachts. He is rejoining Amadeus after a two year absence full of enthusiasm and energy. His hobbies include spearfishing and sailing. He speaks good English. Stelios is 43 years old, married with two children.